SeeBrite™ Tri-LED aquaculture lights are designed using full spectrum LEDs to save energy, promote fish growth, and mitigate sea lice. Our innovative LEDs ensure best conversion of energy to light output. 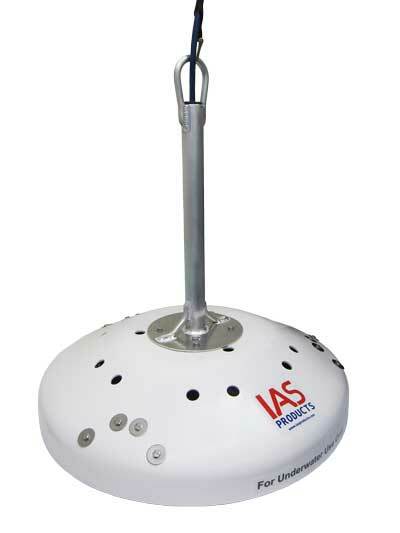 IAS LED lights have a quicker return on investment using less energy to output an equivalent amount of light compared to metal halide and other LED lights. SeeBrite™ Tri-LED light fixtures use an innovative focused spectrum LED utilizing blue, green, and white wavelengths to deliver the required photons to the pineal gland of salmon to help delay maturation. These color spectrums are customizable for specific farm requirements to address water conditions – a light that is perfect for your fish. All SeeBrite™ LED light fixtures offer gradual ramp up to full brightness as required to avoid fish stress that causes poor feed conversion. Happy fish have stronger appetites, are healthier, and grow faster and larger. IAS offers customizable ramp up times for specific species and farm requirements. SeeBrite™ Tri-LED aquaculture light fixtures face downward at depth providing a non-chemical approach to support sea lice mitigation. SeeBrite™ LED light housings within the fixture. Adjust any one, or all of the light housings to create a narrow focus or wide disbursed zone of downward facing light. SeeBrite™ light fixtures are manufactured with a Lexan® shatterproof housing and are built entirely of non-conductive components to avoid the light working as a sacrificial when farm electrical systems are improperly grounded. All SeeBrite™ lights meet UL and CSA standards and CE compliance.